Last year M. and I signed up to be volunteer wildlife transporters for the Colorado Division of Wildlife. It is not a demanding job—we had only a couple of calls in 2009 and none this year until yesterday afternoon. On the phone: a staffer from the CDOW office in Pueblo. 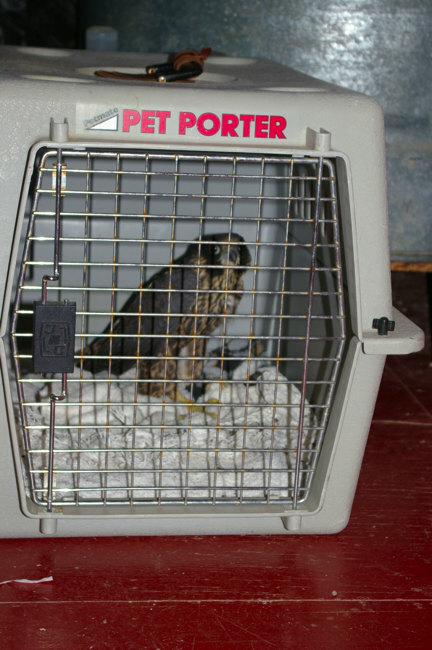 Someone in the Wet Mountain Valley had a hawk in the backyard that seemed unable to fly. So this would be the first "capture and transport," as opposed to just transportation. M. had her hands full, so I put on my official "CDOW Volunteer" ball cap and grabbed up welder's gloves, safety glasses, an Army blanket, and a pet carrier and headed up the canyon. I had expected a red-tailed hawk, given the open country there. When I called ahead for directions, I learned that the hawk had landed on the homeowner's roof, then flew down into the back yard. There it encountered two Australian shepherd dogs, one of whom had "tumbled it" (her words). She had put the dogs in the house, but the hawk would not fly. Maybe it was hurt. The homeowner and two neighbors were waiting. Lucky for me, the bird seemed lethargic, and I could just scoop it up and pop it into the carrier, as though I knew just what I was doing. Unexpectedly, it was a juvenile peregrine falcon, no doubt out on its own for the first time. 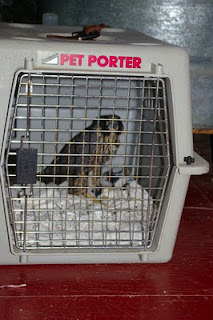 Later that evening, we (M., her visiting nephew, and I) took the falcon to the Raptor Center in Pueblo. I spoke today with the center's director, and she reported that it was hungry and thirsty but seemed uninjured. Perhaps, she speculated, it had flown into a power line or been temporarily stunned through some other mishap. She seemed optimistic that with rest and feeding, it would be ready to return to its wild life. M.'s nephew, 25, had quit his job in Virginia and gone to San Francisco in June to try for something new. But things did not work out for him there, and he landed at our place for a month, uncertain what to do next. We fed and rested him, and today we put him on a plane for home, from which he plans to set out again for a new destination. Fly on, the both of you! I would have been pretty awed by the peregrine discovery too.